The first leg of the Oregon Tuna Classic is in the books. More than 60 teams signed up for the Newport event but due to strong north winds blowing all week the seas were a bit too sporty for some cutting the field to 36 teams at the starting line for the 6am Saturday morning flare start. Most boats ran to the northwest towards tuna town partly because that’s where the most recent fish reports had come and partly to stay with the pack for safety reasons. Some teams stayed in and later came to watch the weigh in but at the end of the night more than 300 people joined in at the awards BBQ. The forecast was barely within the parameters of the OTC criteria for fishing and participants could testify to the conditions by the way they felt at the end of the day with sore muscles from dancing in the rough seas, backs aching from the long ride out and back, tired but satisfied they had given a good effort to help feed the hungry in Lincoln County. The north winds had pushed the warm water out to beyond 60 miles and had scattered the fish making for scratch fishing at best. The best of fishermen were humbled when only 19 teams turned in fish and only 12 of those teams turned in the required minimum of 5 fish. At the end of the day 78 fish had been turned in totaling 1,510 pounds of fresh albacore going to the Lincoln County Food Share. Team Engage from Ilwaco took the top honors with 105.55 lbs and now leads all teams in the points system to win the right to fish in the IGFA Offshore World Championships next spring. They are followed in second place by Team Gales Creek Tuna Gaffers with 104.2 lbs and Team Green Lightning Laundry secured the third place spot with 104.10 lbs. 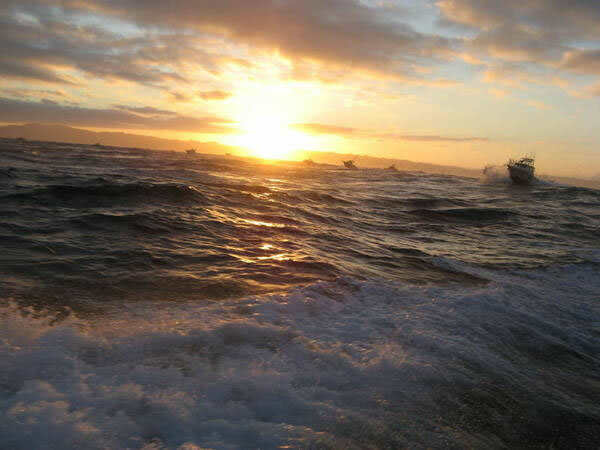 The Oregon Tuna Classic will take its armada of boats, volunteers, sponsors, spectators and support staff to Ilwaco Washington on July 31st. for the second leg of the tournaments where over 78 teams and 500 people packed the event last year. The boardwalk will soon be buzzing with excitement again in anticipation of the teams rolling into town. This entry was posted on July 20, 2010 at 10:30 pm and is filed under HEADLINES. You can follow any responses to this entry through the RSS 2.0 feed. You can leave a response, or trackback from your own site.